Click the Help link in the upper-right corner of any Etsy page. The Site Policies page appears. DOs & DON’Ts: This web page outlines Etsy’s expectations with respect to membership, conversations, transactions, feedback, shops and listings, flagging, and community. Privacy: This web page clarifies how Etsy treats personal information that it collects and receives. Copyright & IP: This web page spells out Etsy’s policy with respect to copyright and intellectual property (IP) infringement. Fees: This web page gives you the lowdown on Etsy’s fees — including listing fees, transaction fees, advertising fees, and payment-processing fees — as well as info on paying your bill and currency conversion. 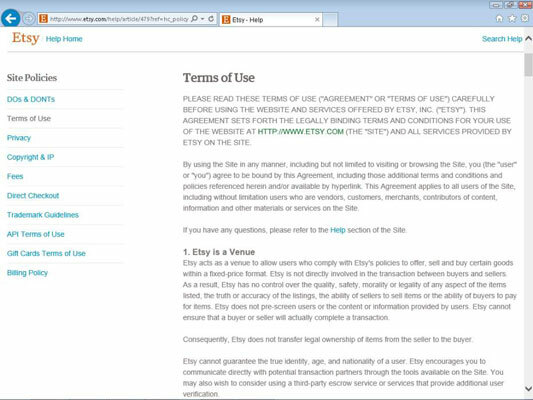 Trademark Guidelines: This web page states Etsy’s guidelines for protecting its trademark. Billing Policy: For info about Etsy’s billing policy, visit this web page, which covers auto billing and manual billing.